I have hung a copy of this piece above my work table since finding it on a wall in Siena, Italy. 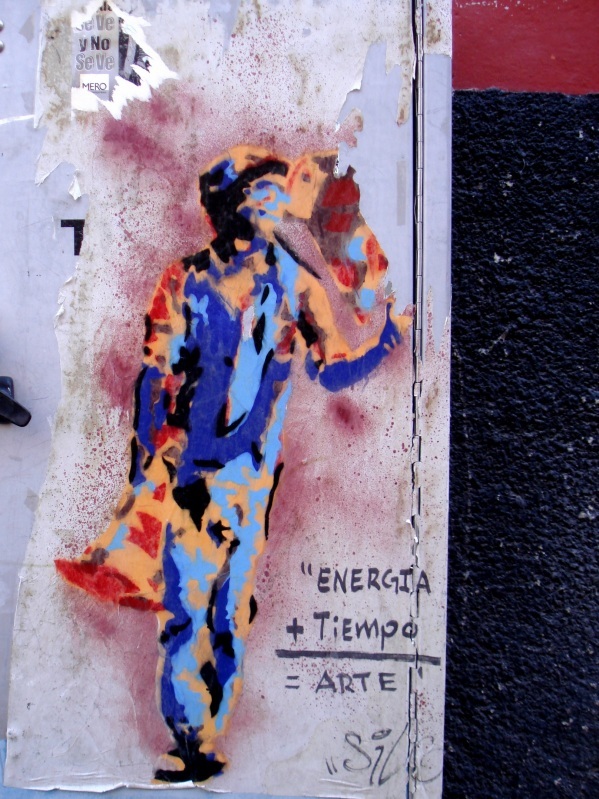 Its simple wording: “Energy plus Time equals Art” has reminded me of what, until recently, I considered the essentials. Whenever I have been caught in the web of ennui the figure has lifted its megaphone to its lips and loudly declared into my reluctant ear that which I haven’t wanted to hear and I have reacted with renewed energy. But its message is lost on me now and I have put this photo away along with a small mountain of unfinished work – all that seems equally meaningless to me at this time. This particular posting is timely because, as some of you have gently hinted and others may have noticed, I have not shared my own art for a while. I have been in a debilitating creative slump and nothing I do to alleviate it has worked. My paintings are not speaking to me – every brushstroke feels false, every colour I apply feels alien and amateurish and every shape, form and line I make appears ridiculous. I know we all go through this at times but that knowledge doesn’t help. I have at least a dozen pieces that I have started that scream out to be resolved. I turn my head. I look at this posted photo and its words and understand that I need to put time and energy into my work but also realize that this is no longer enough. There is another element not mentioned by this anonymous street artist – call it X, or magic or inspiration or self confidence – whatever it is, it is missing and I feel alone. I am away for a few days visiting friends on Vancouver Island to moodle and putter. Will post again on my return.